I am always delighted when two people have decided to build a life of love together. Many modern couples consider themselves to be “spiritual but not religious,” yet they still want to have a meaningful marriage ceremony that expresses both their love for each other, and their faith in a Higher Power, by whatever name they call it. 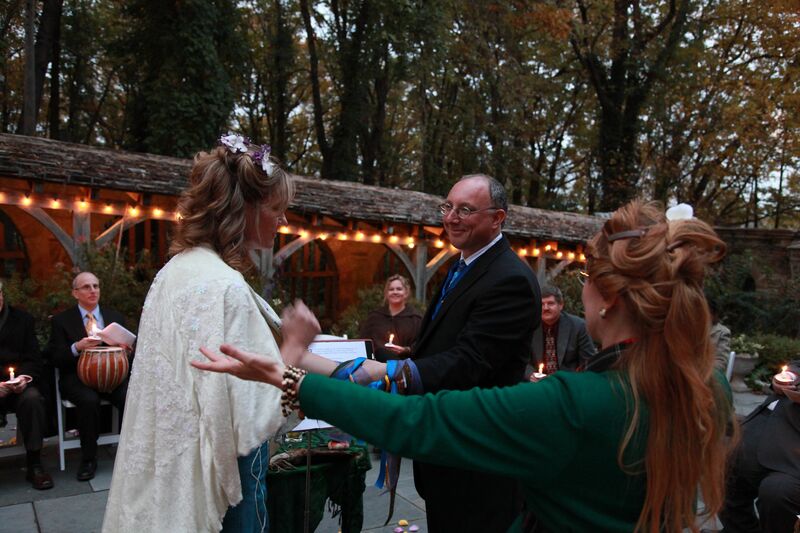 Non-traditional wedding ceremonies are a specialty of mine! As an Interfaith Minister with The Sanctuary of Adoration (ordained in 1994), I can draw upon customs and scriptures of many faith traditions. I will work with you to incorporate your favorite passages, poems, and music into a liturgy that respects the wishes of all the parties. Do you espouse a Nature-based or polytheistic religion, but your relatives are more conservative and traditional? Not a problem. I know how sensitive this kind of family dynamic can be. I have long experience in choosing scriptures that intersect several belief-systems, making everyone feel comfortable. When you choose me as your officiant, neither you nor anyone in your family will feel like they are selling their principles short. Same-gender partners are welcome! The founders of The Sanctuary of Adoration have long been looking forward to the day when Marriage Equality would become a reality. So long as your ceremony is held in the state of Maryland, I can tie your knot. My honorarium for Officiant Services is $300, which includes consultation, a rehearsal, the ceremony itself, and a tithe to The Sanctuary of Adoration. Call (443) 537-7828 or email Rosanna@RewriteYourStars.com to get started.